Hugo Boss fragrances epitomise the essence of luxury, youthfulness and unconventionality that is so integral to the Hugo Boss fashion line. The brand is split between two universes: the irreverent and upbeat Hugo, and the slick and sophisticated Boss. 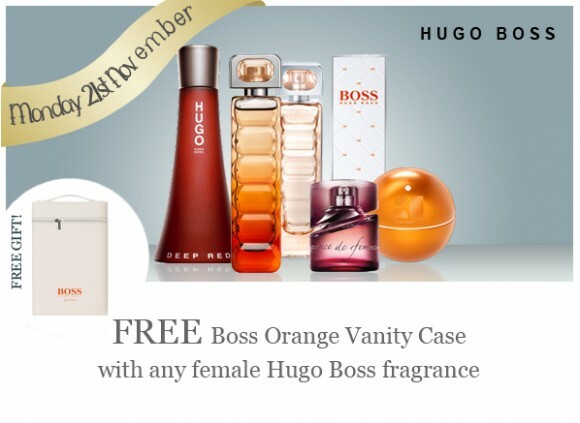 Choose from best-selling fragrances like Hugo Deep Red and Boss Femme, or perhaps the newer Boss Orange and Boss Orange for Her are more to your taste. Whichever feminine scent you opt for, you’ll receive a beautiful Hugo Boss Vanity Case with your purchase. The stylish case is tall enough for you to store all of your beauty essentials, and its rigid structure is ideal for protecting breakable objects. Give them a little added surprise this Christmas – or keep it all for yourself. Discover the entire Hugo Boss fragrance range right here at Escentual. Simply add your chosen scent to the basket, and your free gift will be added automatically. This entry was posted on Monday, November 21st, 2011 at 8:00 am and is filed under Christmas, Gifts, Offers. You can follow any responses to this entry through the RSS 2.0 feed. You can skip to the end and leave a response. Pinging is currently not allowed.